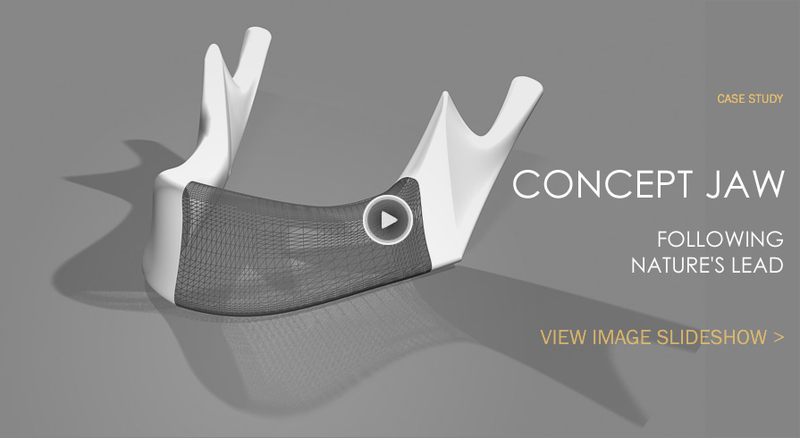 Our design team’s experience in the Aerospace and Motorsport industry, where the use of Finite Element Analysis (FEA) for parts is common place, has been combined with the trabecular lattice featured in Autodesk Within Medical to produce this concept jaw implant. The implant bridges a large section of the lower jaw and has been filled with trabecular lattice. Typically, jaw implants are made from solid titanium and as a result are heavier than human jaw bone but here the lattice lightweights the implant and may also aid osseointegration - the mechanical interlocking of bone and implant through bony ingrowth into the implant. The use of FEA combined with the powerful optimisation tools found in Autodesk Within ensures the implant is also designed for mechanical performance. Taking into account local stresses and displacement, the density of the trabecular lattice varies throughout the implant. As a result, the lattice is thicker where rigidity is required and thinner where not required. The design team also modeled a complete jaw, taking into account the material properties of human bone, and applied FEA for comparison to the Jaw + Implant model. When comparing the two models, you can see how closely matched the results of the Jaw + Implant model are to the results of a fully bone model. Our team of developers is working hard for FEA capability to be available in Autodesk Within Medical. Until then we are offering our consultancy services to apply FEA and optimisation results to designs created using Autodesk Within Medical.